Okay this is a hodge podge. Great Gifts. 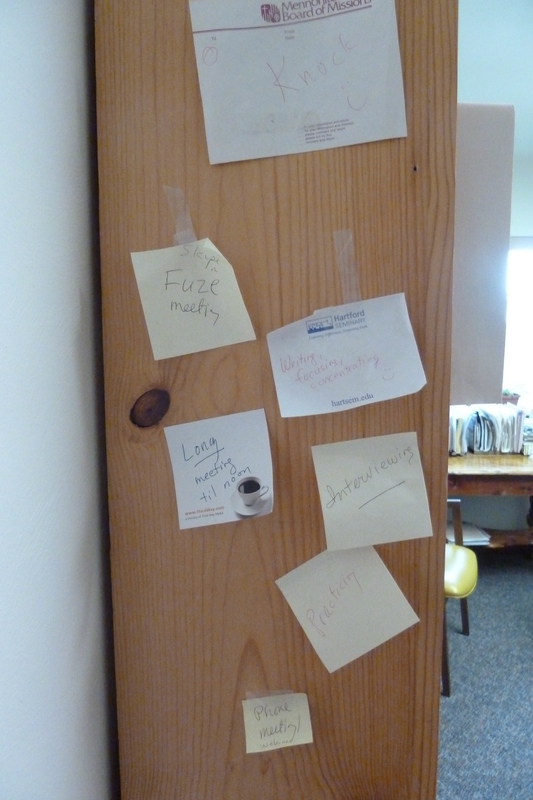 A few weeks ago I shared my “I’m working even if my door’s closed” post about my somewhat ramshackle post it notes informing my coworkers of what was going on behind my closed door. See below. Yes, but my sister beat her to it. 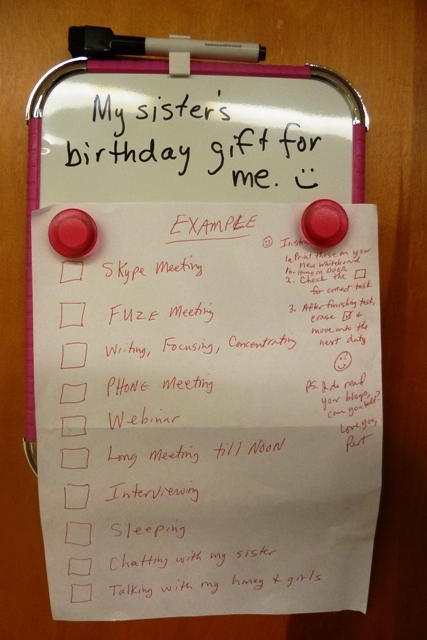 For my recent birthday what did I get in the mail but a handy dandy office door (or refrigerator) message blaster. Otherwise known as the dry eraser board, miniature size. Pert said “See, I do read your blog!” And I love her gift, especially the Pert-esque note she often includes in her surprise packages. Only she added a few of her own original examples which I’ve not been putting on my door! I must add that my brother-in-law, Richard, also sweetly got one of these handy dandy memo boards when my husband retired, to keep his honey-do lists straight. We keep that on the refrigerator. Rise ‘n Roll. Speaking of readers, I opened the stats yesterday a little shocked to see I’d had a ton of new views (for me), coming from Amish365.com to my most visited post ever, about Rise ‘n Roll Donuts (found in various spots across northern Indiana, even Chicago, I hear), in which I tried (and kind of failed) to recreate a recipe for the to-die-for donuts. I was thinking about trying again this fall at a time when some family were around to enjoy the sweet goodness. 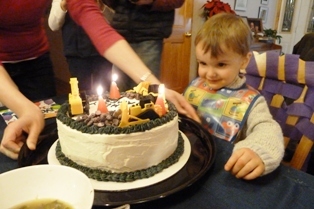 But one of my grandsons was diagnosed with celiac disease late this summer/early fall. So now I’m on another hunt: yummy recipes he can enjoy too. Learning Gluten-free. My first attempt at gluten free baked goods were the pumpkin cookies James came to like the weekend of his first birthday—pretty much his first cookie ever. Now he is three, and while sweets are still limited at his house, he (and all of us) were pleasantly surprised how tasty these pumpkin cookies could be with a simple substitution of gluten-free flour. Pert’s gift for another occasion. She seems to know what’s perfect. So I was excited to read over at Mennonite Girls Can Cook blog just last week of Julie’s recipe for gluten free donuts. They use a flour blend you make yourself, which they’ve called “Julie’s Flour Blend.” I haven’t decided yet whether to take the plunge and invest in all those ingredients. No doubt I will, in time, but I thought the news was worth sharing in this odds and ends post. Are you or someone you love a great gift giver? They always seem to have an angle for picking out just the right gift (it may be small) or greeting card? What does it take to be a great gift giver? Glad to know James is looking forward to his pumpkin cookies. Now we just have to keep the big pumpkins out of them until Christmas! He seems to be able to manage his wishes well! I like your hodge podge – everything you are thinking of right now is lodged here. Your lists on white board and door are intriguing. About a week ago my youngest grandson gave me a list of “What I Want for Christmas.” All 5-6 items involved a cat: 1. cat 2. cat litter box 3. cat toys . . . . Neither the parents nor grandparents are interested in their having a cat. The household already has a huge dog! That said, I do believe in giving gifts, monetary and otherwise. You have already read about the gifts of letters we gave to our 13-year-old grand boys. Those are the best kind, I think, after all. I like your youngest grandson’s gentle hinting here! I’m sure you all have reasoned with him that their dog may not get along with a new cat in the house, either. Our dog is SO jealous of the cat, although they share Stuart’s lap in the evenings. I’m glad your writing is getting out there! I will try your gluten-free pumpkin cookies. Thank you. Do you need the gluten free diet too? It certainly seems to be a need these days. It was a big surprise for our daughter’s family–never had much in the way of allergies in our immediate family. Thanks for commenting!